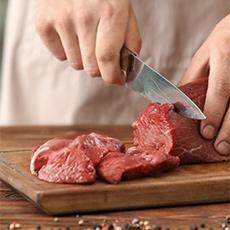 Trim fat from steak and cut it into small, thin pieces. In a large skillet, heat oil and sauté garlic until garlic is golden. Add steak, vinegar, salt, and pepper. Cook for 6 minutes, stirring beef until brown. Add onion and tomato. Cook until onion is transparent.